Rachel Flynn at a recent meeting of the Bay Area Planning Directors Association. Oakland's Director of Planning and Building Rachel Flynn reportedly told a conference of real estate developers in San Francisco yesterday that Oakland's residents are not facing an affordable housing crisis. Her comment was tweeted out by several attendees, including journalists. Flynn made the comment while speaking on a panel of planning directors from major cities organized by the Urban Land Institute, a developer funded-think tank. Her comments also sparked some strong criticism on social media. Brian Hanlon, an attendee at the conference, tweeted several of Flynn's remarks, which have been widely circulated on social media. Oakland Planning Director: "There is no housing crisis in Oakland." Hanlon followed up with another tweet describing a comment Flynn made, that because of recent housing price spikes, Oakland renters might need to double up with roommates to afford their apartments, "which is no big deal." She thinks people might need to get a roommate, which is no big deal. Roland Li, a real estate reporter for the San Francisco Business Times who was also attending the panel discussion, confirmed over Twitter that Flynn said there is no affordable housing crisis in Oakland. Li described Flynn's comment as downplaying talk of a housing crisis. Rachel Flynn of @oakland downplays talks of a "housing crisis," says she doesn't believe Oakland will hit expensive heights of NY, SF. Flynn did not return a phone call this morning seeking further clarification about her comments. Some Oakland residents responded angrily to the notion that the city isn't experiencing an affordability crisis. Living in a rapidly gentrifying area of #Oakland & my rent went up 25% this year. My city govt doesn't think there's a housing crisis. AMA. Flynn's remarks are at odds with the experiences of many Oakland residents. Just last week the city council hosted an hours long special hearing on the topic of affordable housing. Dozens of Oaklanders told the council they were experiencing shockingly high increases in their rents, and some spoke about being recently displaced, or facing the prospect of being pushed out of Oakland because of the increasingly expensive housing market. Recent reports show that Oakland's rents and home prices have increased faster than virtually any city in the nation. Oakland's median rent is now $2,650, according to Zillow. Oakland's median household income is $52,583, according to the US Census. Thus the median household must spend 60 percent of its total income to rent the median home, which is twice the level that is considered affordable. A UC Berkeley report issued in July described the neighborhood around Oakland's MacArthur BART neighborhood as experiencing severe changes that are driving out lower-income homeowners and renters. "The severity of the affordability crisis continues to accelerate, with continuously rising rents and a tremendous jump in rates of housing burden," the report concluded. In a statement issued last week, Mayor Libby Schaaf used the word crisis to describe Oakland's housing situation. Erica Derryck, a spokesperson for Mayor Schaaf, didn't return a phone call and email this morning seeking comment about Flynn's remarks. Screen grab from the ULI's Fall Meeting web site. The panel discussion where Flynn talked about Oakland's housing issues last night was part of the Urban Land Institute's Fall Meeting. The Urban Land Institute is a real estate industry-funded think tank. 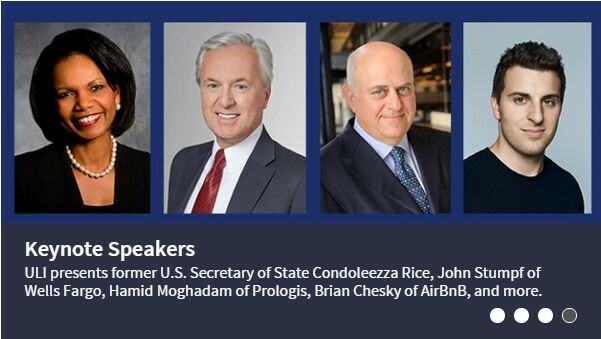 Keynote speakers at the conference include Brian Chesky of Airbnb, and former Secretary of State Condoleeza Rice. On Monday, conference goers were taken on a tour of Oakland billed as "a legacy of opportunity," and shown recent and underway development projects like the Fox Theater and Brooklyn Basin. Today, Flynn is scheduled to speak on another conference panel about Oakland's downtown along with developers Michael Ghielmetti and Richard Weinstein.